Circuit2Circuit provide a comprehensive range of covered car transport delivered with exceptional service. Our knowledge and range of vehicles ensures we provide the most efficient transport method to suit your requirements. We aim to streamline your time and optimise your operation by taking care of everything from initial customer liaison and collection to final delivery. With Circuit2Circuit you’re in safe hands and our experience ensures a professional service every time. All our vehicle movements are within covered car transports, ensuring your car is delivered discreetly, securely and is not at risk by any elements such as the weather or stonechips during the journey. Circuit2Circuit offer the right covered car transport for you; being a single movement trailer, doubles or with our 5 car artic, moving 5 vehicles at once - perfect for your whole team! Our proven Motorsport backgrounds within F1, BTCC, Moto GP and sports cars etc guarantee that we can also accommodate your requirements outside the driving and presentation duties such as Tyre man, Garage Operatives etc. We truly understand the importance of correct personnel allocation. We have a wide variety of vehicles capable of transporting between 1 and 6 cars. 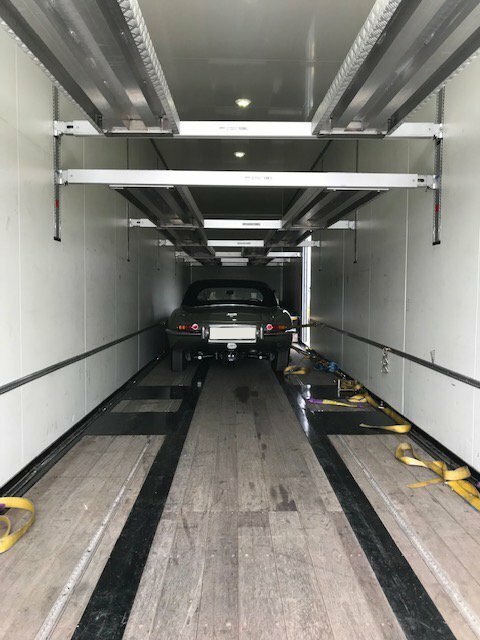 For the urgent last minute one car transport we have a selection of covered car trailers available for Classic, Racing or personal road cars. We also have a fleet of Mercedes Sprinter long wheel base vans, which are constantly ready to move to any venue in Europe. All our vehicles are supplied with a fully experienced uniformed driver who will look after your vehicle as if it were his own. "Both Paul and I have found Circuit2Circuit services to be very complete, courteous and discreet. Circuit2Circuit carry out their business in a very professional fashion." "The service from Andy and C2C was first class. I had stressed for a while about how we were going to get the car down to Spain (this TM lark is all a bit new to me - my background is as a race engineer), but in the end once we contracted with you it all went super smoothly and I was really pleased with everything. At some point in late July we will need to bring the car back to the UK, so I will be in touch to arrange that. Thanks and all the best." ""I wanted to say a big thank you to you and to Paul. The show car looked great on the stand this week and really helped to generate interest. Paul did a great job - very professional, punctual and efficient. Thanks again!"" ""Just wanted to say Thanks for delivering/collecting the Tyrell. I'm so glad it all went smoothly. Our paths may cross again, come and say Hello if you're ever at the events FJ attend.""